How much does the grave cost? Does the cemetery require an outer container? (At this time there is no law requiring an outer container/vault, but cemeteries may require them). How much does it cost for the opening/closing of the grave? These cost may be from $50 to over $1000. 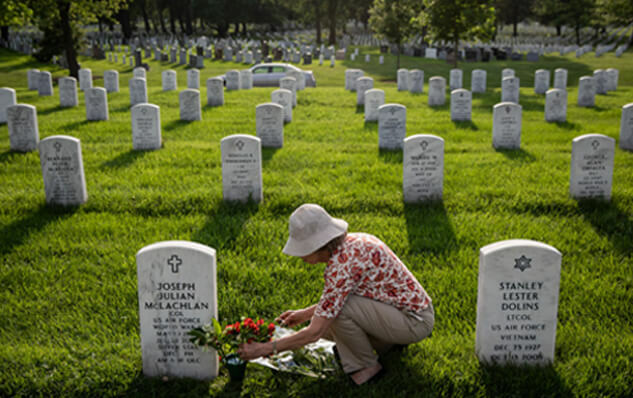 If you are an honorably discharged veteran, you can be buried in a veterans cemetery at no cost to you and your outer container/vault is provided along with your grave marker. Your spouse and dependent children may also qualify to be buried there for a small fee. What type of grave markers does the cemetery allow? This is a partial list of cemeteries in our area. We hope this may assist you when making a choice of a cemetery. Grave price no set fee, donations accepted. This cemetery does not require a Vault or outer burial container. The opening and closing cost Monday-Saturday $450.00 and on Sunday and Holiday's $675.00 Cremains are $100.00. There are no after hour charges. You can contact Leboy Dunkin at 870-637-3830 if you have further questions. Grave Price is $400.00. This cemetery does require a vault or outer burial container. The opening and closing cost is $725.00. Holiday and Sunday price is $825.00. No after hour charge. Cremains price is subject to change so just call their office. You can contact Wilson Funeral Home 870-563-2877 if you have further questions. Honorably discharged Veterans and spouses may be buried here. There are no charges for the Veteran and a $300.00 charge for the spouse. The cemetery furnishes the grave, opening and closing, a pavilion to have a service, and a grave marker. Cremains may also be buried there or put in their wall. You must have a DD-214 and you may be prequalified and we will gladly help you with that process. Grave Price for traditional burial or cremains are $350.00. This cemetery does require a vault or outer burial container. There is no after hour charge. The opening and closing cost is $450.00 and holidays and weekends are $500.00. Cremains prices are subject to change. You can contact Don Oberg at 870-273-6544 if you have further questions. Grave price no set charge – will accept donations. This cemetery does not require a vault or outer container. The opening and closing cost is $200.00. There are no Holiday or weekend Charges. There are no after hour charges. This is a Private cemetery and they have limited space and it is just for spouses only. You can contact Marvin White at 870-931-2927 if you have further questions. Grave Price are 0. This cemetery does not require a vault or outer container. The opening and closing cost is $400.00. The holiday and weekend charge $500.00 and $100.00 extra after 4pm any day. The cremains are $300.00. Family members only in this cemetery. There is No after hour charge. You can contact Buddy Rauls at 870-539-6412 if you have further questions. Grave price $100.00. This cemetery does require a vault. The opening and closing cost is $400.00. The Holiday fee is $500.00. Weekend fee are $450.00. The cremains are $50.00. The Graves must have corner blocks placed around the grave and they are $40.00 each. There is no after hour Charge. You Can contact Jean Hass at 870-239-5855 for further questions. Grave price $75.00. This Cemetery does require a vault. The Opening and Closing is $50.00. The Holiday& Weekend Fee is $ 0. The Cremains price is $75.00. There is no after hour charge. You may contact Lisa at City Hall 870-482-3716. Grave Price $100.00 for locals and $200.00 for people out of town. Opening and Closing is $450.00 after 4pm its $100.00 more. This cemetery does not require a Vault. Cremains done by local man will be $40.00 but if mike does it then it will be more. Holiday and Weekend $500.00 after 4pm $100 extra. You can contact Janice Coud at 573-654-3439 or Mike Patton 573-559-8469 if you have further questions. Grave Price is $100.00 for 2 people. The opening and closing is $400.00. This cemetery does require a vault or outer container. Cremains price are $ 300.00. Holiday fee $500.00. Weekend $450.00. No after hour charge. You can contact Mark Graftenreed 870-239-1217 if you have further questions. Grave Price is $600.00. The opening and Closing cost $400.00 or up to family to find a digger. Holiday and weekend is $450.00. Cremains are $50.00. This cemetery does require a vault. You can contact Dr. Jon Collier at 870-476-3080 with further questions or Ronny Piuge at 870-882-6410. Grave Price is $1000.00 + 200.00 for care fee. The opening and closing price is M-F & 8-4:30 $850.00. Holiday fee is $1350.00. Saturday is $950.00, Sunday is $1050. This cemetery does require a vault or outer container. Cremains are $525 second right if interment they need a vault also. There is after hour charges of $200.00 if you are there after or before 4:30pm, you have to be there right at 4:30. You can contact Cobb F.H at 870-780-6009 if you have Further questions. Opening and Closing of the grave is $850 Monday-Friday before 4:00 p.m., $975 on weekends before 4:00 p.m., $1075 on Holidays before 4:00 p.m., and $75 additional charge after 4:00 p.m. They do require an outer burial container. Grave Price is $1000.00 + 200.00 for care fee. The opening and closing price is M-F & 8-4:30 $850.00. Holiday fee is $1350.00. Saturday is $950.00, Sunday is $1050. This cemetery does require a vault or an outer container. Cremains are $525 second right if interment they need a vault also. There is after hour charges of $200.00 if you are there after or before 4:30pm, you have to be there right at 4:30. You can contact Cobb F.H at 870-763-4431 if you have Further questions. Grave price is $400.00. The opening and closing cost is $300.00. This Cemetery does require a vault or outer container. Holiday fee is $400.00. On Saturday is $350.00 and Sunday is $400.00. Cremains are $400.00 if no plot is bought already. There is a $25.00 headstone fee to set it. There is no after hour fee. You can contact Johnny Bryan at 870-531-2340 if you have further questions. Grave price is $350.00. The Opening and closing cost is $500.00. This cemetery does Require a vault or an outer container. Holiday & weekend fee is $500.00. Cremains price is subject to change. There is no after hour Fee. You can contact Tabby or Mark Stockdale at 870-656-8538 if you have further questions. Grave price is $35.00. Open and closing is the choice of the family who digs. This Cemetery does not require a vault. Cremains by cemetery is $35.00. There is a 1x fee of $300.00 for Ground up keep. There is no after hour charge. You can contact Margie Henderson at 870-328-7247 with further questions. Grave Price is $400.00. Opening and closing is 300.00. This Cemetery does require a vault or an outer container. Holiday and Sunday fee is $400.00 then Saturday is $350.00. Cremains if spread on family by family its free but if a hole needs to be dug its $50.00. There is no after hour charge. You can contact City Hall 870-531-2340. Grave Price is $795.00. Opening and Closing cost is $725.00. This Cemetery does require a vault or an outer container. Holiday & weekend is $825.00. Cremains prices are subject to change and you need a vault. There is no after hour charge. You can contact Wilson Funeral Home at 870-935-2774 if you have further questions. Grave price no set charge – will accept donations. Opening and Closing cost is $400.00. This cemetery does require a vault or an outer container. Holiday $250.00. Weekend $150.00. Cremains are $200 with tent and $150.00 to just dig hole with on family grave. There is no after hour charge. You can contact David King at 870-935-8683 if you have further questions. Grave price no set charge – will accept donations. Opening and closing is $300.00. This cemetery does not require a vault. Holiday and Weekend price are $350.00. Cremains prices are $150.00. There is no after hour charge. You can contact David Wagster at 870-240-6046, Jerry Darter is the digger, #573-225-4646 if you have further questions. Directions: hwy 49 into Piggott, pick up hwy 62 to St Francis (8 miles) CR 341 Black top runs out there will be gravel on left on rd.Close to Pumpkin Hollow. Grave price is just a $ 50.00 permit. Opening and closing is $400.00. This cemetery does not require a vault or outer container. Holiday and weekend $500.00. Cremains are $300.00. There is no after hour fee. You can contact Paul Harris at 573-346-4858 with further questions. Grave price no set charge – will accept donations. Opening and closing is $300.00. This cemetery does not require a vault. Holiday and Weekend price are $350.00. Cremains prices are $150.00. There is no after hour charge. You can contact David Wagster at 870-240-6046 if you have further questions. Grave price is $500.00. Private Cemetery and the Family has to find the own digger. Cremains are $0 if no plot needed. There is no after hour charge. You can talk to Barbara Sewell at 870-647-2585 if you have further questions. Grave price is $500.00 with a $ 7.00 1x document fee and a $50.00 fee to mark the grave. Opening and closing is $500.00. They do require a vault or open container. Holidays and Weekends are $500.00. Cremains are $100.00. There is no after hour charge. You can contact Charlotte Lindsey at 870-974-0391 if you have further questions. Grave Price is $100.00. Opening and Closing is $500.00. Holiday, Weekends, and Cremains are $500.00. They don’t require a vault or an outer container. There is no after hour charge. You can contact Marilyn Price at 870-586-0507 with further questions. Grave price is $200.00 for 2 people or $500.00 for 6 plots. Opening and closing is $500.00. They don’t require a vault or outer container. Holiday & Weekends are $500.00. Cremains are $500.00 unless family wants to dig a 2ft hole. There is no after hour fee. You can contact Lee Fuller at 870-597-4209 if you have further questions. Grave price is $200.00- 250.00. Open and closing cost is $400.00. This Cemetery requires a vault or outer container. Holiday fee is $600.00, and Weekend $500.00. Cremains are $0 if funeral home digs hole but if the digger does it then its $200.00. There is no after hour fee. You can contact Maurce Watkins at 870-219-8722. Grave price $200.00. Opening and Closing cost is $450.00. This does not require a vault or outer container. Holiday and weekend price is $500.00. Cremains are $200.00. There is no after hour charge. You can contact Steve Pierce 870-919-0342 with further questions. Grave Price $300.00. Opening and closing cost is $400.00. This does not vault or outer container. Holiday and Weekend $500.00 and $100.00 after 4pm any day. Cremains $300.00. He has a late charge of $100.00 if not gone by 5pm. You can contact Pam Felts at 573-225-4702 with further questions. Grave price no set charge – will accept donations. Opening and closing is $450.00. Holidays and weekends are $500.00. Cremains are $200.00. There is no after hour charge. This Cemetery does not require a vault or outer container. You can contact Brain Clapton at 870-243-1951 with further questions. You must be of the Catholic faith! Grave price $250.00. Opening and closing M-Sat $450.00. This cemetery requires a vault or an outer container. Holiday and Sunday $500.00. Cremains are subject to change. There is no after hour charge. You can contact Martha Strafford at 870-919-3694 with further questions. Grave price $50.00. Opening and Closing is $450.00. This cemetery does not require a vault or outer container. Holiday and weekends are $450.00. Cremains are $150.00. There is no after hour charge. You can contact Kenneth Welthford 870- 319-5080 with further questions. Grave price is $300.00. Opening and Closing is $400.00. This cemetery does not require a vault or outer container. Caretaker is Don Gillian 870-378-4132. Grave price no set charge – will accept donations. Opening and closing is $450.00. Holiday and weekend is $450.00. Cremains are $150.00. This Cemetery does not require a Vault. There are no after hour charges. You can contact R.A Right at 870-759-0121 with further questions. Grave price no set charge – will accept donations. Opening and closing is $400.00 during the week and $500.00 on weekends and holidays (Charlton Cupp 870-215-1472). This cemetery does not require a vault or outer container. Cremains are $50.00 to bury. There are no after hour fees. You can contact Keith Fielder at 870-530-0661 if you have further questions. (New part) Grave price $300.00-600.00. (new part) opening and closing is $400.00-500.00, the old part family can do everything themselves. The New part does require a vault or outer container and the old doesn’t. The new part holiday and weekend price is $650.00, the old is varied in price. Cremains are $100.00. There is no after hour fee. You can contact Chris at 870-866-3434 with further questions. Grave price is $300.00. Opening and Closing is $250.00. No vault required in this cemetery. Holiday & Weekend price is $300.00. Cremains are $250.00 with new plot, free if family digs the hole. There is no after hour charge. You can contact City Hall at 870-539-2252 with further questions. Grave price is $750.00. Opening & closing is M-f $200.00. Holiday & weekend fee $300.00. Cremains are M-F $50.00, Holiday & weekend $150.00.This Cemetery does require a vault or outer container. There is no after hour fee. You can contact Tammy Wyatt at 870-475-2415 if you have further questions. Grave price is $300.00. Opening & closing is $400.00. This Cemetery does require a vault. Holiday fee is $500.00. Weekend fee $475.00 and Cremains are $100.00. There is no after hour fee. You can contact Clark Dillard at 870-633-2612. Grave price $250.00. Opening and closing M-F $125.00 and nights M-F $155.00. This cemetery does not require a vault or outer container. Holiday & Weekend $155.00. Cremains M-F $50.00 & Holiday & weekend $150.00. There is no cemetery fee unless past 4:00 pm then it’s $155.00. You can contact City Hall at 870-239-7500. Grave price $500.00 but they have some resales that are cheaper. Opening and closing is $600.00. This Cemetery Requires a vault. Holiday & Weekend is $600.00. Cremains are $ 300.00 that is for the O/C and record keeping. There is no after hour fee. You can contact P.G Maners at 573-333-2300 with further questions. Grave Price $300.00 plus $5.00 a year for up keep fee. Opening and closing is $700.00. Holiday & Weekend $800.00. This cemetery does not require a vault or outer container. Cremains $300.00 or the family can dig. There is no after hour fee. You can contact Kenneth Shannon at 870-740-2203 with further questions. Grave Price $400.00. Opening and closing is $400.00. This cemetery does not require a Vault. Holiday and weekend are $400.00. Cremains are $0. There is No after hour fee. You can contact Tommy Swetnam at 870-219-1239 if you have further questions. Grave price $500.00. Opening and closing is $250.00. This cemetery does not require a vault. Holiday and Weekend $250.00. Cremains are $50.00. No after hour fee. You can contact Dewight Booth at 870-243-4374. Grave price no set charge – will accept donations. The opening and closing price is M-F $850.00. Holiday fee is $1350.00. Saturday is $950.00, Sunday is $1050. This cemetery does require a vault or outer container. Cremains are $525 second right if interment they need a vault also. There is after hour charges of $200.00 if you are there after or before 4:30pm, you have to be there right at 4:30. You can contact Cobb F.H at 870-763-4431 if you have Further questions. Grave price is $1000.00. Opening and close is $400.00. This cemetery does not require a vault. Holiday fee is$250.00. Weekend $150.00. Cremains $200.00 with Tent and $ 150.00 to dig with a plot already. There is a fee of $2.00 per mile from his shop to the graveside. There is no after hour fee. You may contact Larry Russum at 870-932-2811 with further questions. Grave price is $660.00.Opening & closing is $995.00. This cemetery does require a vault or outer container. Holiday is $1990.00/ Weekend Saturday $1195.00, Sunday$1395.00. Cremains with tent/chairs are $695.00 and without tent/chairs are $495.00. Cremains must have an urn in a vault, and the vault with Gcmg are $395. No after hour fee. You may contact Jennifer at 870-236-8412 with further questions. Grave Price is $1000.00 + 200.00 for care fee. The opening and closing price is M-F & 8-4:30 $850.00. Holiday fee is $1350.00. Saturday is $950.00, Sunday is $1050. This cemetery does require a vault or outer container. Cremains are $525 second right if interment they need a vault also. There is after hour charges of $200.00 if you are there after or before 4:30pm, you have to be there right at 4:30. You can contact Cobb F.H at 870-763-4431 if you have Further questions. Grave Price is $795.00. Opening and Closing cost is $725.00. This Cemetery does require a vault or an outer container. Holiday & weekend is $825.00. Cremains prices are subject to change and you need a vault. There is no after hour charge. You can contact Wilson Funeral Home 870-563-2877 if you have further questions. Grave price $1075. Opening and closing $995.00. This cemetery does require a vault or outer container. Holiday $1595.00. Weekend Saturday$1125.00 Sunday$1395.00. Cremains M-F no set up $395.00, Saturday $495.00, Sunday and holiday $780.00. No after hour fee. You can contact Christy at 870-563-6578 if you have further questions. O/C Monday through Friday $850.00 price increases: $100.00 on Saturday, $200.00 on Sunday, $500.00 on Holidays. O/C for cremains $525.00. Will put two in one plot. Requires an outer container. Grave Price $300.00. Opening and Closing is $400.00. Holiday and Sunday are $500.00. Saturday is $450.00. Cremains are $175.00. No after hour fee. You can contact Dana McKuin at 573-334-7117 with further questions. Family needs to meet with Dana before the funeral to confirm grave location and sign paperwork. Grave Price is $250.00. Opening and Closing is $400.00. This cemetery does not require a vault. Holiday and Weekend is $450.00. Cremains are $250.00 or $50.00 (Charlton cup). There is no after hour fee. You can contact Glinda King at 870-239-4324 if you have further questions. Grave Price is $500.00. Opening and closing is $500.00 during week-weekend and holiday is $600.00. This cemetery does not require a vault. Burial of cremains is $250 M-S and $300 on Sunday. There is no after hour fee. You can contact Howard Burns at 573-695-3630 or 573-359-7833 with further questions. Grave price Side A $650.00 and side B$ 225.00. Opening and closing is $425.00. This cemetery does require a vault or outer container. Holiday is $800.00. Weekend are $650.00. Cremains Weekday $200.00 and Weekends $350.00 if you stay to watch the casket drop they ask that you stay at least 50ft back please. There is no after hour fee. You can contact Lance Merritt at 870-930-4696. Grave price no set charge – will accept donations. Families must find diggers and get price and they do require a vault or outer container though. They do request that a permanent marker because families already have rows of family plots marked. You need to contact Mrs. Nelda Adams before marking and with any further questions at 870-919-8929. Grave Price for $175.00 for 11ft and $100.00 for a 9ft. Opening and Closing is $400.00. This cemetery does require a vault or outer container. Holiday and Weekend are $400.00 if there is a monument that will need to be moved before the grave can be dug there will an additional $200.00 charge. Cremains are $50.00. There are no after hour fee. You can contact Bill Lott at 870-240-8832 and he will contact digger and answer any further questions. Grave price is $75.00. Opening and Closing is $450.00. This cemetery does not require a vault. Holiday and weekend is $450.00. To bury cremains the family can dig the grave. There is no after hour fee. Grave Price is $200.00. Opening and Closing is $400.00. This cemetery does not require a vault. Cremains price are subject to change. Holiday and weekend are $400.00. There is no after hour fee. You have further question you can contact Carolyn Hester at 870-878-6538. Grave price no set charge – will accept donations. Open and close is $400.00. This cemetery does not require a vault. Holiday fee is$250.00. Weekend $150.00. Cremains $200.00 with Tent and $ 150.00 to dig with a plot already. There is a fee of $2.00 per mile from his shop to the graveside. There is no after hour fee. You can contact Tommy Cox at 870-972-9322 if you have further questions. Grave price no set charge – will accept donations. Opening and closing is $500.00. This cemetery does not require a vault. Holiday’s Vary $500.00 and up. Weekend is $500.00. Cremains are $150.00. There are no after hour fee. You can contact Parrish 870-595-4504 if you have further questions. Grave price is $500.00. Opening and closing is $400.00. This cemetery does require a vault or outer container. Holiday is $250.00. Weekend is $150.00. Cremains are 200.00. There are no after hour fee. You can contact John Broadway at 870-932-1586 with further questions. Call David Cline for information on purchasing a grave. Opening and closing is $450.00 Monday-Friday and $500.00 on Sunday. Brad Clark is the grave digger 870-897-6239. This cemetery does require a vault. Cremains $200.00 with tent and $150.00 to dig with a plot already. Grave price no set charge – will accept donations. Opening and Closing is $400.00. This cemetery does not require a vault. Holiday and weekend is $450.00. Cremains are $50.00. There is no after hour fee. You have further question you can contact Jane Wheeler at 870-239-6303. Grave price no set charge – will accept donations. Opening and closing is $450.00. This cemetery does not require a vault. Reserve a spot and its $200.00 that pays for the ground up keep of plots. Holiday and Sunday are $500.00. Saturday is $450.00. Cremains are $150.00. No after hour fee. You have further question you can contact Teddy at 870-926-4475. Grave price no set charge – will accept donations. Open and close is $400.00. This cemetery does not require a vault. Holiday is $400.00. NO Christmas or Thanksgiving. Weekend is 400.00. Cremains are $200.00. There is no after hour fee. There is no after hour fee. Can give Donations to help with the ground up keep if you can. You can contact Judy Shumming at 870-249-3208 if you have further questions. Grave price no set charge – will accept donations. This cemetery does not require a vault. Open and close is $15.00 for people that live in county, then out of county people pay $400.00 and will be in the Benton area plots all digging is $15.00 for in or out of county people. There is no after hour fee. You can contact Thomas Fullbright at 870-805-9704 if you have further questions. Grave price no set charge – will accept donations, just need permanent marker. Holiday and Weekends are $400.00. Cremains Family can dig their selves. This cemetery does not require a vault. There is no after hour fee. This cemetery works off Donations. You can contact Kenneth Pugh at 870-586-0417 if you have further questions. Grave digger is Chris Cappleman 870-476-8822. Grave price is 2 people for $200.00 or $100.00 apiece. This cemetery does not require a vault. Opening and Closing is $500.00. Holiday and Weekend is $500.00. Cremains family can dig them as long as the hole is 2ft deep, but if digger has to do it then it will be a charge of $500.00. You can contact Davon Hamilton at 870-761-2136 if you have further questions. Mike Tarr does opening/closing. Grave Price is $400.00. Opening and Closing cost is $725.00. This Cemetery does require a vault or an outer container. Holiday & weekend is $825.00. Cremains prices are subject to change and you need a vault. There is no after hour charge. You can contact Wilson Funeral Home at 870-563-2877 if you have further questions. Grave price is $100. Opening and Closing is $400.00. This cemetery does require a vault. Holiday fee is $250.00. Weekend $150.00. Cremains $200.00 with Tent and $ 150.00 to dig with a plot already. There is a fee of $2.00 per mile from his shop to the graveside. There is no after hour fee. You can contact Rick Carter at 870-930-6985 if you have further questions. Grave Price is $250.00. Opening and Closing is $400.00. This Cemetery does require a vault or an outer container. Holiday is $500.00. Weekend is $450.00. Cremains are $100.00 by hand and $400.00 with backhoe. There is no after hour fee. You can contact Dillman Cupp at 870-236-8509 if you have further questions. Grave price no set charge – will accept donations. This cemetery does not require a vault. Open and Closing is $450.00. Holiday is $500.00. Weekend is $450.00. Cremains are $0 by hand and $225.00 with backhoe. There is no after hour fee. You can contact Steve Pierce at 870-919-0342 if you have further questions. Grave price is $400.00. This cemetery does not require a vault. Need two checks written for Opening and Closing $400.00 and $25.00 to James Pickard. Holiday & weekends are $500.00. Cremains are 275.00 but only 1 urn in each family members grave. Baby Burial or Cremation on weekdays $275.00 weekends or Holidays its $375.00. There is no after hour fee. You can contact James Pickard at 573-276-7975 if you have further questions. Grave price is $ 0 but a $200.00 deposit. This cemetery does not require a vault. Opening and Closing is $450.00. Holiday and Weekend is $450.00. Cremains are $0 if put with a family member, but if needs new plot its $200.00. Family and Church based Cemetery. There is no after hour fee. You can contact Paul Sheets at 870-897-9239 if you have further questions. Grave price is $50.00. Open and close $450.00 (Brad Clark 870-897-6239) This Cemetery does require a vault or an outer container. Holiday is $500.00. There is no after hour fee. You can contact Mr. Kim Imbodin cell 870-926-0626 Office (Imbodin Ag) 870-932-4780 if you have further questions. Trinity Cemetery Association, P.O. Box 429, Bono, AR 72416. Grave price is $550.00. Opening and Closing is $425.00. This Cemetery does require a vault or an outer container. Holiday & weekends are $525.00. Cremains are $0 but plot price is subject to change. There is no after hour fee. You can contact Jerry Smith 870-549-1150 for opening/closing of the grave. Call Danny to get grave marked. Grave price no set charge. These plots are for church and family is why there is no charge, and most have plots marked. This Cemetery does require a vault or an outer container. Opening and Closing is $400.00. This cemetery does require a vault. Holiday fee is $250.00. Weekend $150.00. Cremains $200.00 with Tent and $ 150.00 to dig with a plot already. There is a fee of $2.00 per mile from his shop to the graveside. There is no after hour fee. You can contact Vergie Dorton at 870-935-6138 if you have further questions. Grave Price is $795.00. Opening and Closing cost is $725.00. This Cemetery does require a vault or an outer container. Holiday & weekend is $825.00. Cremains prices are subject to change and you need a vault. There is no after hour charge. You can contact Wilson Funeral Home at 870-563-2877 if you have further questions. $175.00 for cremains. Brad digs. Cemetery contact: Bonnie Dean at 870-886-2080. Located between Walnut Ridge and Sedgwick, left before the light at bypass at WR. Grave price is subject to change. Opening & closing is M-F $400.00. This cemetery does not require a vault. Cremains are $175.00. Weekends Saturday $450.00 & Sunday $500.00. Holiday M-F $575.00, Saturday $625.00, Sunday$675.00. There is no after hour charge. Jacksons Funeral Home in Harrisburg is helping till new member is found so contact them at 870-578-2452. Grave Price is $200.00. Opening and Closing is $500.00. This cemetery does not require a vault. Weekend $500.00. Cremains are $150.00. Holidays depend on the holiday so call ahead to find out price. There is no after hour charge. Contact Betty Eamon at 870-595-4090 with further questions. Grave price $300.00 plus $50.00 1x care fee. Opening and Closing is $300.00. This cemetery does not require a vault. Holiday & weekend $350.00. Cremains are $150.00. There is no after hour charge. Contact Jerry Darter at 573-225-4646 with further questions. Grave Price is 200.00. Opening and closing is $400.00. This Cemetery does require a vault or an outer container. Holiday and Weekend is $450.00. Cremains are $50.00. There is no after hour charge. Contact Gary Archer at 870-239-3844 with further questions.